A Nigerian immigrant in Italy caused a public scene on Saturday afternoon in the heart of Reggio Calabria. He allegedly damaged an entrance door to the offices of the city’s cathedral, according to reports, 'police officers in San Francesco da Paola, a few meters from the main entrance of the building, chased him before he reached a square and climbed a building through some service pipelines'. 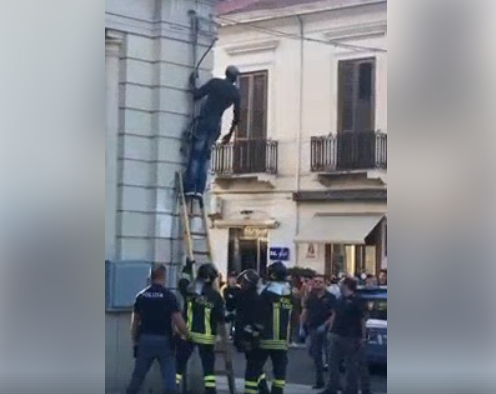 He threatened to cut the wires as he was armed with knife, he further asked the police and officials who surrounded him to get away so he can escape. But unfortunately, the knife slipped from his hand and he was left unarmed as can be seen in the trending video posted online. As stated earlier, the immigrant caused a public scene as the square was filled with onlookers who witnessed the scene. 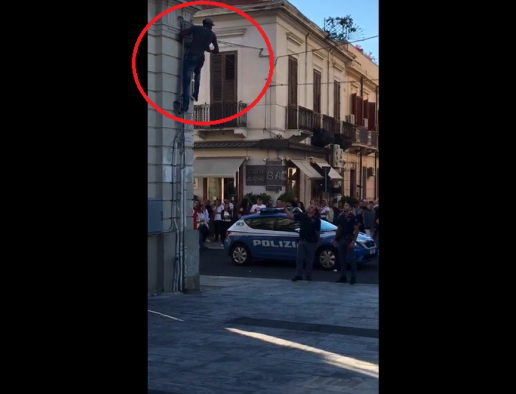 At last, he came down after the police set up a ladder for him before he was apprehended and taken to the station.